I had thought today would be the last instalment in the tour, then I counted the number of quilts and images I have left, so we will take it in two trips. Yesterday we left by what I called the fifth entrance, between Eileen's book quilt and 'Where is the North Star? ', we need to turn right to continue on around the gallery. The outer wall on this side has a quilt I posted about in the making (see May and June archives), 'Joker'. It was supposed to have one of several far more clever titles, but it's working name stuck, and I suspect will do forever now. I thought of it as almost a wholecloth as the quilting was always going to be a very large part of the design. Looking at it finished this seems an odd way of seeing it but I never said I made sense. I wanted a quilt that would make a good present for two friends without asking them any of the important question s like, what size bed do you have or what colours do you like in the bedroom? Well they aren't terribly subtle if you want to surprise someone. So we got thinking about how we saw them and what things they like. Stage magic and cards had to feature, we decided that very quickly, but white? No I couldn't make a mostly white quilt, I don't enjoy it and well they aren't white people. How do you get around it, you invert the colours. 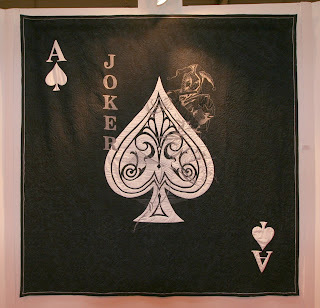 The ace of spades (the most decorative card in most decks) would work really well like that. I also wanted to incorporate a harlequin. It didn't really fit, but a joker did and seemed close enough. Asking for a scan of a nice joker seemed a much more subtle question and indeed I think I got away with it. They certainly seemed pretty pleased with the quilt and will soon have a new bedroom for it to live in. This is the only show this quilt will ever be see n in, it's job is to go and keep a bed warm. As we come around the corner of the gallery we come to three quilts in a row I managed to keep very quiet before the show. I wanted to have some surprises, but this one really pained me. I was so excited when I first did them. You will see them in revers order but I don' t think that's a problem. 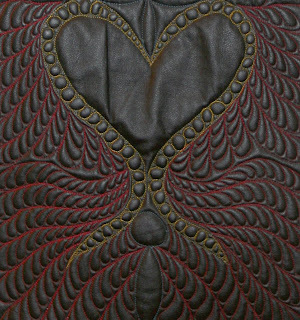 I've done quite a lot of work with leather in the past, but I've never got around to quilting any. I think that is because I am very aware that you only get to stitch leather once. The holes don't heal. However, things change earlier in the year I went round a lot of London fabric shops with a couple of friends and I fell in love with a couple of small leather skins. One thing lead to another and they followed me home. my friends being quilter not only helped plan the idea but they nurtured it too. and before I knew it one of the skins was on my frame. Scary? Oh yes. Very. The first quilt we are looking at is actually from an offcut I had. I made a few of these 'normal' shaped leather pieces, but to be honest they don't really talk to me. I love how the colour works on leather, and I really wasn't sure it would. The trickiest part was binding it. I knew it needed a binding, but I didn't want to use cloth, and a double fold of leather wasn't going to happen. I then realised there were corners (yes I know sometimes I am not so bright). If I over lapped the ends of the binding like you would on a traditional straight corner binding the corners would be huge. As leather doesn't fray I decided to just trim t he ends flush. It's clean and tidy without getting bulky. Simple. 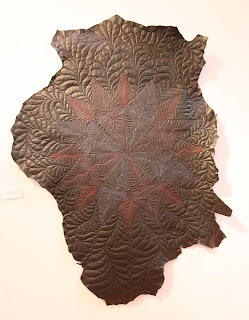 The next quilt 'Leather Star' was the second leather quilt I made. I was getting braver and felt I could chance marking some designs. I quickly discovered that if the marking shows on the leather and will come off, it comes off too soon but with some care I managed to get in the lines I needed. This is also the quilt were I tested colour. It worked, but was more subtle than I expected. By choosi ng to leave the edge of the skin un-trimmed I gave myself a lot of hand sewing to do finishing the backing, and the shape proved to be quite a challenge, but I think it was well worth it. I love the very natural look. It took a lot of trial and error to get the design to fit the irregular skin and I was concerned they may fight, they don't and I love this quilt. 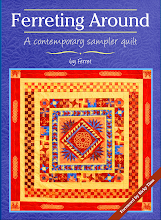 I am so fond of it that when we were looking for some quilting for the background of my book cover this is the quilt I chose. Yes I did find it amusing sending a picture of the secret quilt to over 100 people before the show, and being pretty confident they wouldn't guess what it was. Certainly no one commented on recognising it at the show. 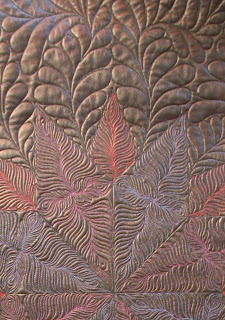 The last of the leather quilts is 'Leather Feathers' (I know, you try naming quilts at 5am after a month of sleep deprivation). 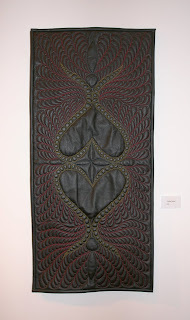 This was the first of the leather quilts I made. I find it quite strange that after years of struggling with this style of feather I chose it as my safe pattern for working on leather. It was partly because I didn't think spiky patterns really fitted the very soft leather. I wanted a soft design. The first stitch was very stressful but once I was underway all I wanted to do was work on leather. I do have a lot more plans in this direction, so watch this space. Ah one last thing, that a lot of people asked, yes these are real quilts, with 80/20 wadding in them. 'Leather Feathers' has two layers in it to fatten the feathers and because I was worried the thickness of leather would hide the puff of the wadding. 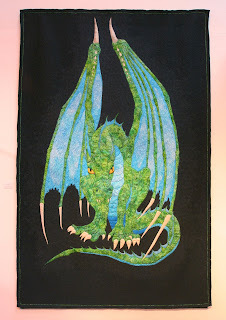 The last quilt in tonight's installment is 'Dragon'. There is more going on with this one than I think most people knew. The idea probably started with needing something to balance the 'Phoenix', something with a lot of presence that wanted and needed to be big. I also had a plan for something along the lines of a self portrait, as people keep suggesting I should do one. So the idea was born, to make a quilt of my dragon tattoo. Only two little problems. I wanted it to be very clearly the same dragon and it needed to be in a different pose. Fortunately I am still in touch with the artist who did my tattoo work, Glenn Wallbridge and he kindly agreed to draw me another dragon. Even better he came and traced the full size one for me too. This quilt then became a test piece for 'Bad Rain', which we will get to tomorrow. I wanted to keep the style of the original artist, not overwhelm it with me. I learned a lot from this quilt, which will actually have some more quilting added to it, as I can see where I haven't quite got all the shading he put in. It's OK now, but I know it can be better. 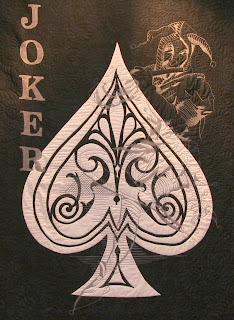 This is another quilt that provoked interesting reactions. It regularly startled people who approached from entrance 5 behind it, but more interesting to me was what people saw in it, especially children. A lot of adults commented on how scary it was, some said it was threatening. Children though got it, it hasn't made up it's mind yet, she's just watching. Yes she has rather large claws and is in general quite big, but she is just looking and deciding what to next. While we were still setting up one of the fabric traders came round and looked at the quilt I was binding, he asked if any of the fabrics were his, I wasn't sure. It was lovely later in the show to run into him again and send him to look at 'Dragon'. All her green fabric came from his stand at Sandown. In fact I thin k most of the staff got to come and see it too. 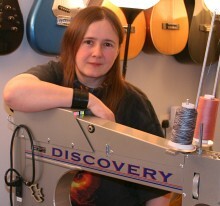 I love the idea that traders can get to see where their fabrics and threads ended up. So often you sell something and it's gone. Much more fun to see it grow up. One lady who picked a lot of brown fabrics for me and posted them special delivery so I could finish my cows was very proud when it won at the FOQ last year. I really enjoy being able to share the buzz with others. Sometimes when I teach I will take my latest show project with me to work on in quiet moments. That quilt then becomes that groups special quilt too. It's so good to see them when they first see 'their' quilt finished, and I think the enjoy it too. Tomorrow the last of the quilts. I've also added a couple more links in Link Frenzy. 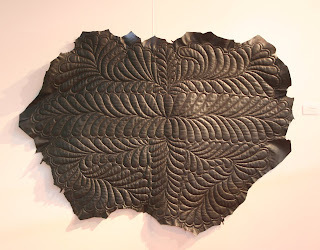 My friend and I must have spent about 10 minutes looking at the leather pieces trying to figure out how you did them - they are really, really stunning! Pictures don't do justice to the texture. Was it hard on the longarm? Ha Ha the Joker quilt is mine, all mine (um...that is, ours). We loved the quilt as we saw it coming to life on the blog and we really did have no idea it was for us. When we arrived at the show and you took us around to see it hanging up we were stunned by it. When you said it was for us I was literally speechless (which doesn't happen often) and even a bit tearful!